Netflix has been growing at a rapid pace over the past few years, with international expansion, a focused strategy on original content that gets people talking, and an affordable price point that appeals to younger subscribers. Because of this, Netflix has surpassed 100 million subscribers this year, their CEO Reed Hastings casually celebrating with a steak dinner at Denny’s last week. He certainly has reason to smile. We wanted to compare this growth to the total number of cable television subscribers Comcast currently has, so we browsed through Comcast’s Q1 2017 financial reporting. As you can see in the report, Comcast currently has 28.9 million subscribers, adding 279,000 over the last three months. It’s of course important to point out that naturally we’d expect a service with massive popularity that only costs 1/5th of its cable counterparts to have more subscribers. 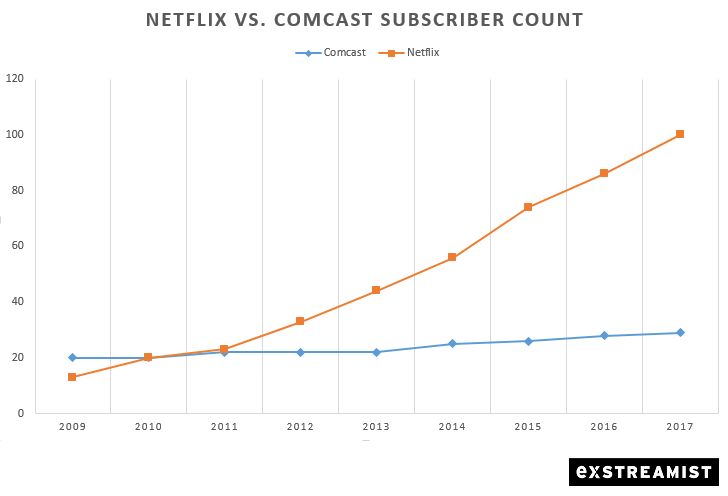 But the interesting thing is of course how much faster Netflix is growing their subscriber numbers compared to traditional cable. This can probably be largely attributed to international expansion, territory that Comcast hasn’t touched. But there still seems to be a trend in the younger audiences to avoid signing up for cable altogether, instead opting for streaming services. Very few people in the younger age brackets are rushing to sign up for their own cable subscriptions, while Netflix, at its price and with a content library to match, has much more appeal. Netflix has also been hitting its stride in international markets, bringing a higher quality library with targeted content that is supposed to appeal in these markets. Last year, we reported that there was very little consistency in each country and the number of titles in each region were all over the map. Lately, we’ve noticed less complaints in international markets, and these growing subscriber numbers abroad seem to signal that Netflix is figuring it out.